REINFORCE THE SIMPLE PRESENT TENSE IN ALL FORMS. KEY INCLUDED. 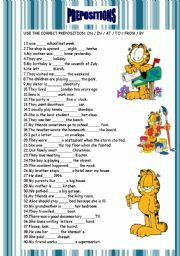 IT CONSISTS OF 4 EXERCISES.IN EXERCISE 1 STUDENTS CHOOSE WAS OR WERE AND ANSWER SHORT QUESTIONS.IN EXERCISE 2 STUDENTS TURN SENTENCES INTO THE NEGATIVE.IN EXERCISE 3 STUDENTS CHOOSE WAS OR WERE.IN EXERCISE 4 STUDENTS CHOOSE WASN`T OR WEREN`T. 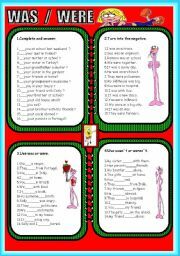 CONSOLIDATE THE SIMPLE PRESENT IN ALL FORMS WITH FAMOUS CARTOONS. CONSOLIDATE THE FUTURE IN ALL FORMS WITH FAMOUS CARTOONS. 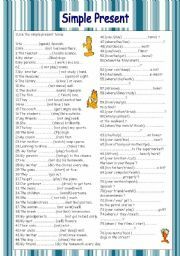 Fort sentences to practise the use of prepositions. key included. Hugs, Bermudenze. 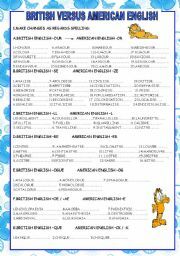 IT CONSISTS OF 3 EXERCISES.IN EXERCISE STUDENTS ANSWER QUESTIONS.IN EXERCISE 2 THEY USE EITHER CAN OR CAN`T.IN EXERCISE 3 THEY UNSCRAMBLE QUESTIONS AND ANSWER THEM. IN EXERCISE 4 THEY MAKE QUESTIONS. 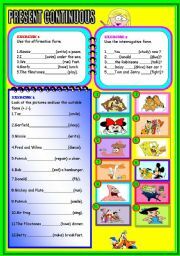 This worksheet is ideal to consolidate the simple past of the verb to be.It consists of four exercises: 1.Complete with was or were and answer the questions , 2.Turn into the negative , 3.Use was or were 4.Use wasn`t or weren`t.Students will enjoy the beautiful cliparts. 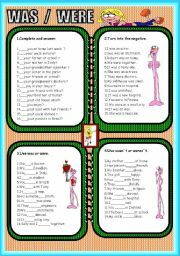 CONSOLIDATE THE PRESENT CONTINUOUS IN ALL FORMS WITH FAMOUS CARTOONS. 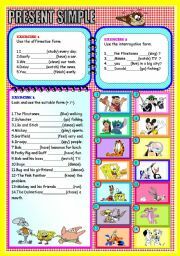 IT CONSISTS OF 4 EXERCISES.IN EXERCISE 1 STUDENTS FILL IN WITH THE VERB AND ANSWER SHORT QUESTIONS.IN THE SECOND ONE THEY TURN SENTENCES INTO THE NEGATIVE.IN THE THIRD ONE THEY FILL IN WITH THE CONTRACTED FORM IN THE AFFIRMATIVE FORM WHILE IN THE LAST ONE THEY DO IT WITH NEGATIVE FORM.